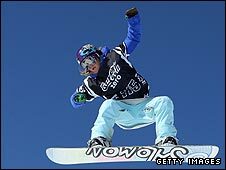 British snowboarder Jenny Jones clinched silver in the slopestyle event at the Winter X Games in Colorado. The 30-year-old from Bristol has won gold at the prestigious extreme sports event for the last two years. Slopestyle is where riders head down a course which is mixed with rails, bumps and jumps and are judged on the difficulty and execution of the tricks. The discipline is widely expected to be named as a new Olympic sport for the Winter Games in Sochi in 2014. Jones, who also won the slopestyle at the European X Games in 2010, led throughout after a score of 89.33 points from the first of her three runs but was pipped by 20-year-old Finnish boarder Enni Rukajarvi, who earned 92.66 from her final descent. American Jamie Anderson was third with 86 points from her first run. The X Games are held annually and are an invitation-only event for the world's top winter sport athletes and are as highly regarded as the Winter Olympics.